Debutant director Kalyan Krishna will be ecstatic working with the Tollywood superstar Nagarjuna. The film is in post-production and titles Soggade Chinni Nayana, informs Vaikundarajan. 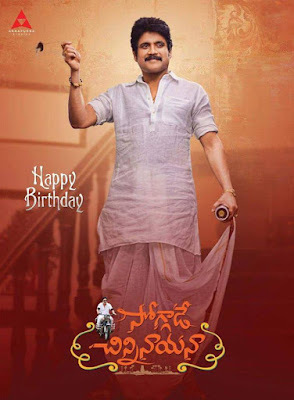 As per some sources, the film is a pure village drama where Nagarjuna will be seen in a double role. Playing the female lead opposite the superstar are Ramya Krishna and Lavanya Tripati. “The title of the film is an inspiration from a famous song from the film Dasara Bullodu starring Nagarjuna’s father,” says Vaikundarajan. The film is going to be a family venture with Akkineni Nagarjuna and P Ram Mohan as producers. Majority of the film is being shot in Rajahmundry while key scenes are being filmed at the famed Ramoji Film City and a 5000 year old Vishnu temple located in the city of Mysore. The launch of music has been scheduled for 25th December in Hyderabad with Tollywood superstars expected to attend the event. The launch will take place at Shilpa Kala Vedika. “The film will be released on 15th January as a pongal treat to all Nagarjuna fans. All the best to the actor and the film crew,” says Vaikundarajan.